Easy Cinnamon Bun Muffins from Elana’s Pantry Plus Giveaway! Update: Contest has ended and winner has been announced here! Have you tried cooking with almond flour yet? Well, if you do not have a Tree Nut Allergy, then you must give it a go. Really. It will change the way you bake…forever. It is as easy to use as wheat flour, without having to worry about the balancing act/science experiments usually involved with more complex combinations of gluten-free flours. What a perfect contribution to those New Year’s intentions you set. To eat healthier. To focus on real food. To cut back on your simple carbohydrates. You did make those, right? It is safe to say that Elana Amsterdam, also author of the wildly successful and popular blog Elana’s Pantry, has revolutionized the trend of using almond flour in baking and everyday cooking. She has created literally hundreds of recipes using this sweet, rich, buttery, superfood of a flour. And each one that I have tried to date? Delicious. Simply Written. Easy to follow. My kind of cooking. What originally drew me to her cookbook and to her blog were these concisely written recipes. I love using recipes written in this way. I just wish I could master that art in my own recipe writing. Alas, that skill will take some practice on my end. But Elana? She is a pro. To date, I have made many of her recipes. Her chocolate chip cookies have been baking in my oven too many times to count. Her scones? Cinnamon Bun Muffins? 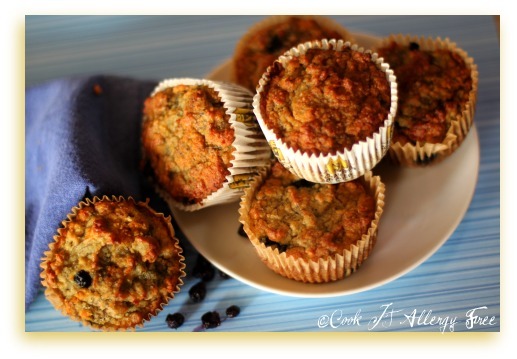 Banana Blueberry Muffins? Bran Muffins? Kale chips? They have all graced my oven. And all have been met with rave reviews from my little gaggle of kitchen critics here. Why am I sharing all of this with you, my diligent and wonderful readers? Because I like you. Because I want you to realize the wonders of cooking with almond flour. And because I am giving away a copy of Elana’s cookbook today. In order to enter for the chance to win, just leave a comment below telling me if you have ever cooked with Almond Flour. Follow Elana’s Pantry on Facebook and you get yourself one more entry. And now, because I love this recipe, and because Elana said I could share it with you today, I am going to leave you with these wonderful muffins. So go ahead and enter to win this amazing cookbook RIGHT NOW. I will be doing a giveaway of her new cookbook, Gluten-Free Cupcakes, once it is released. I will also be doing a series of giveaways each Thursday between now and the end of February of each of my favorite Gluten-Free and Allergen-Friendly cookbook authors. So check back each Thursday for the announcement of the winners from the previous week and for the newest giveaway! I love Elana’s recipes! Her Mexican chocolate ice cream is an absolute favorite around our house. Let’s just say we bought an ice cream machine just to make it. I would love to play around with recipes in this book. Thanks for the opportunity. I just read one of the requirements for entering is to say whether you’ve baked with almond flour or not. Whoops. I haven’t used almond flour before but I have an unopened bag in my kitchen itching to be use. Thanks! Of course, I already have it but I have to chime in and say that Elana has most definitely made the transition to a grain-free gluten-free life a piece of cake, quite literally. I have tried a few of her recipes and wow!! Yummy. I’m new to gluten free cooking/baking but her recipes and the recipes I’ve tried from cook it allergy free have been great. My kids love the meatloaf cups. I have not tried almond flour yet, but I have wanted to. I have recently gone gluten-free so I am still trying to figure all this out! You don’t need to enter me into the giveaway as I already have a dog-eared & lovingly stained copy of her book on my kitchen counter right now! Those cinnamon bun muffins are my FAVORITE! I always make them for company! I love them as many muffins! I follow Elana’s Pantry on Facebook. No.. I haven’t tried it yet..but would love to! 🙂 Thanks for this opportunity! Have never tried cooking with almond flour, recently discovered my 3yr old has multiple food allergies & anaphalaxis to eggs so still researching recipes,ingredients,etc & as peanuts are 1 of his strongest allergies don’t no if i’ll be trying almond flour. Her first cookbook is amazing. Can’t wait to check out the new one. Those muffins sound wonderful. I haven’t baked with Almond Flour yet or even grapeseed oil. I know I can find Almond Flour here but I’ll have to keep an eye out for grapeseed oil. Thank you for sharing, and thank you for the giveaway. I would love to receive her new book. I bake with almond flour so much I buy it by the 20-lb. bag! Aside from coconut flour, it’s all I use. Elana’s recipes are great. I’ve made her pumpkin pie muffins so many times, I know the recipe by memory. I will be looking for it so I can try this recipe out! I follow both Cook it Allergy free & Elana’s Pantry on facebook 🙂 and love cookbooks too! Well written! You make me want to go to the store right now and buy almond flour 🙂 I haven’t tried it before, and am afraid I may have been missing something really good all this time. I’ve only used the Bob’s Red Mill almond flour to make a streusel topping. I’ve read enough to know that Bob’s isn’t a very good source of almond flour. So far, none of the local stores seems to carry anything but that. It looks like I’ll have to go to the web in order to get a type of almond flour that has the qualities needed for serious baking. Thanks for sharing! I will definently have to make a stop by Elana’s blog and check out some more of those recipes. If I’m going to have somelike like a muffin or a cookie, it just seems healthier if it has protein and fiber instead of just carbs. You know I have baked with almond flour! Years, in fact, when my family made the switch to SCD. I borrowed a copy of Elana’s cookbook from the library (that is the copy I showed on my blog when I made a cupcakes version of the chocolate cake with marshmallow frosting) but it would be great to own a copy. Don’t enter me in the giveaway, since I also have her cookbook. Anxiously awaiting the next one. And, you know I love the almond flour. Need to order more. Went through my 10 pounds last month. Just wanted to say, “hi.” Because we don’t talk very much on the internet. 😉 And, I already follow you and Elana. yes, i love cooking with almond flour! i feel best (by far) when i eat grain and sugar free. i tend to wing my recipes based on what i have and some guidelines on the internet, but it would be nice to get a cookbook with more recipes. I only use almond flour in an orange cake, but it makes it moist and sweet. I’d love to see how versatile it can be in other things. I LOVE baking with almond flour!!! So glad we don’t have any allergies here….yet! The texture is perfect for the muffins, quick loaves, cookies, and I even throw some in with our sandwich bread recipes….YUM! Yes, I follow Elana’s Pantry on FB…..I can’t find her book at the store, so would love to get a copy!! Thanks! I LOVE cooking with almond flour and recently made Elana’s Orange Almond Torte for a dinner party to dip with coconut milk chocolate fondue. Everyone loved it! I would love to baking with Almond flour. Can’t wait to get my hands on this cookbook!! I haven’t tried using almond flour yet. I would really like to try it though….it seems more nutritious than the rice flour combo I usually use. I have cooked with almond flour. I have made Elana’s Chocolate chip cookies with it and they are delicious. I LOVE Elana’s almond flour recipes! They are definitely the the best wheat alternative recipes out there. I’d love a copy of Elena’s cookbook! I’ve only recently become aware of the benefits to using almond flour and haven’t yet experimented with it yet. However, this year my goal is go as grain free as possible so I will certainly be trying almond flour very soon! These muffins look delicious and like an amazing way to start trying! I liked you on facebook and can’t wait to start enjoying your wonderful hard work! Thank you for working so hard for all of out there who benefit from it! I liked Elana’s Pantry as well. I have made Spunky Coconut’s Thumbprint cookies using almond flour. SO delicious! 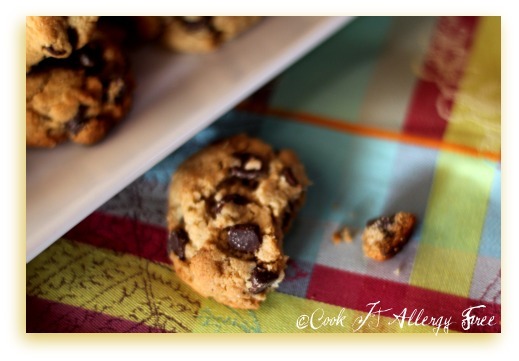 I already like Cook IT allergy free on Facebook! I like Elana’s Pantry on Facebook! I have used almond flour and absolutely love it. Elana has some great recipes. I like Elana’s Pantry on facebook. I have tried several of Elana’s gf recipes but never tried any that require almond flour. I am in the process of ordering some so I can have a bigger variety of foods in my diet. I’m a huge (HUGE) fan of Elana’s. I love everything she posts and am also a total convert to almond flour. I go through more of the stuff than you can shake a stick at! I use Almond flour and make Elanas famous cookies too. I now follow you on Facebook too! I already like Elana’s Pantry on facebook. I have liked cook it allergy free on facebook. I’ve never cooked with almond flour. Can’t seem to find it anywhere near me. Would love to try it though. I have not cooked with almond flour, but I would love to try! I love almond flour! It works so well in pancakes and chocolate chip cookies! Great blog! Will be a good resource for me as I do not have a lot of experience with baking gluten-free. I have not used the flour because of its cost. But would LOVE to. I would try it with some of these recipes though. Would be great to win the cookbook!! Thanks. Well, I have tried baking w/Bob’s Red Mill Almond Flour/Meal. I think I would like to try again using a different brand. 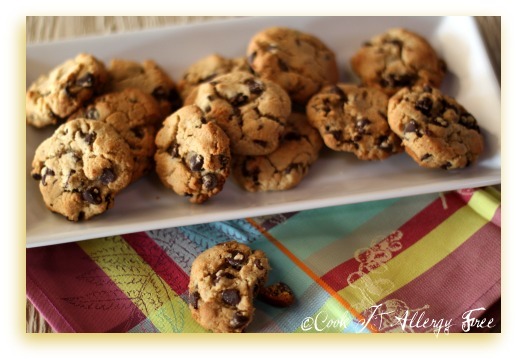 The chocolate chip cookies look divine! Thanks for hosting this giveaway! I am 4 months into a Gluten Free diet and have been experimenting with the new baking ways of the diet. 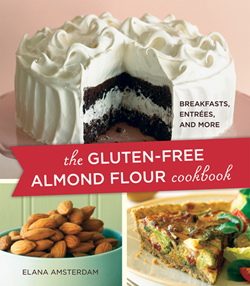 I haven’t tried Almond flour but will definitely do so and would love the book to compliment my baking. I LOVE elana’s recipes and follow her on FB! I’m new to all of this & haven’t used almond flour before. Sounds like I should give it a try! I have never used just almond flour, but I have used mixes that come with almond meal. I am interested in trying it ! Yes I have baked with almond flour, thanks to Elana!!! And we love it!!! I follow you on FB!!! And I follow Elans’s Pantry on FB!!! i haven’t tried cooking with almond flour, but after reading this information, i can’t wait to! i haven’t been following on Facebook, but have just found you and have “liked.” Very excited about this site! Thanks for sharing!! I’m new to GF baking – not used almond flour yet. Love your web site. Lots of great info! I have only cooked with almond meal that I made myself in a coffee grinder after blanching the skins off. Too bad I am allergic to cinnamon but cardamom would be a fantastic replacement for these. I would Soooo love to have this book. I LOVE using almond flour! I haven’t tried any of Elana’s recipes yet — I just recently discovered her — but I can’t wait to try them (starting with this yummy one!). I also just followed you, and Elana’s Pantry, on facebook. Thanks for this opportunity! What a great recipe! I have baked with almond flour before–I made my own, without realizing that’s what it was called! I have a recipe for very easy almond cookies in my cookbook which use the flour. Yum! I’d love to have Elana’s cookbook and try out all her fabulous recipes using this flour. The only thing I have seen that suggested Almond flour was pie crust – so I’m really excited to try something new! I’m just so excited that my husband was diagnosed in a time when there are so many options! Thank you! I just found Elana’s blog last week (and immediately followed her on facebook). Cooking with almond flour has been an amazing discovery for me as i am currently on a grain/soy/sugar free diet. Being able to guiltlessly bake has been amazing and i would love the opportunity to try the recipes in her cookbook! I would love a copy of this book – her recipes are amazing! I’ve only ever made Chinese/Macanese almond cookies with almond flour. Elena’s recipes look delicious, and I’d love to try them out. I just became friends with Elena’s Pantry. Thanks so much for posting the cookbook. I put in on my wish list on Amazon. It sure looks awesome!!! I can’t wait!!! The broccoli soups looks good from the cook IT allergy free FB link! Thanks so much for all the help and links!! Yes, used it for the first time making traditional butter cookies – thumbprint with jam 🙂 Works perfectly since the nuttiness is great! I have been eying this cookbook for a LONG long time – I hope I win!!!! Follower on Facebook! Love her information and recipes! I am diabetic too and almond flour is brilliant as it stops the peaks and then troughs. Use it in lemon drizzle cake, just use 80% almond flour and 20% cornflour instead of plain flour works a treat! Thanks so much for the amazing review; I greatly appreciate it!